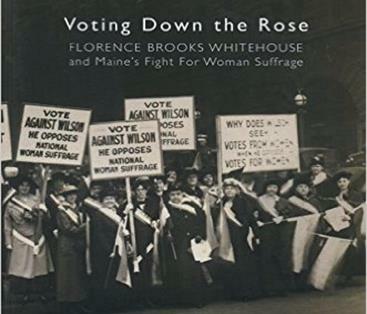 Anne B. Gass will present her book, Voting Down the Rose, a lively account of Maine native, Florence Brooks Whitehouse, who campaigned for the right of women to vote. Told from Whitehouse’s perspective, often in her own words, this important book brings Maine's suffrage history to life and illustrates the difficulty state suffrage leaders experienced trying to navigate between the demands of national organizations and their local constituencies. Gass is Florence Brooks Whitehouse’s great-granddaughter. he lectures regularly on Florence Brooks Whitehouse and Maine suffrage history and continues her great grandmother’s activist tradition in her professional life. This lecture is co-sponsored by Falmouth Memorial Library and The Falmouth Historical Society and presented as part of our ongoing Library/OceanView collaborative lecture series. This event is free and open to the public. Copies of Voting Down the Rose will be available for sale and signing courtesy of the author. For more information, please contact Jeannie at jmadden@falmouth.lib.me.us.